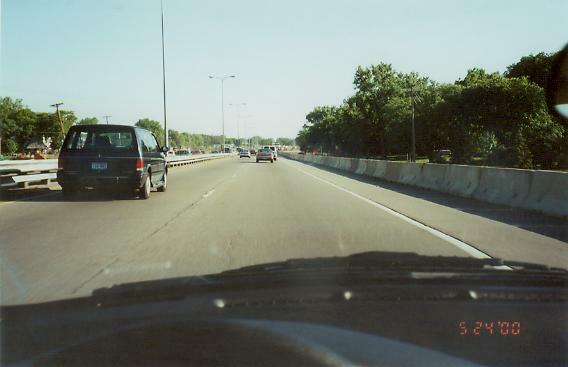 This page started as a collection of photos documenting the reconstruction and upgrading of Minnesota Highway 100 in the western Twin Cities area between I-394 and Hennepin CSAH 152/Brooklyn Blvd. With that project completed, plus photos of other segments of MN 100 being taken, this page has morphed into an overall MN 100 photo page. This first page shows the terminus photos and northbound mainline photos. All photos are shown in sequence by location. Though this jumps the date/year sequence in many cases, it makes for easier flow through the corridor plus allows for making photo-to-photo comparisons of the same location in different years/stages-of-construction. A second page shows both southbound mainline photos and photos of nearby locations related to the reconstruction project. Many thanks to Glenn Olson for the initial sets of construction photos. 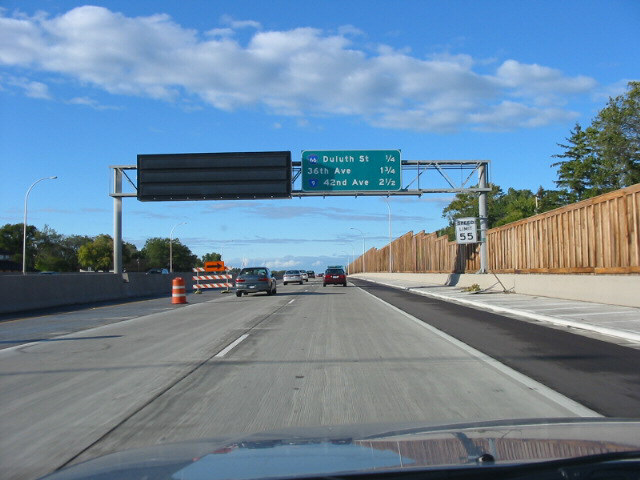 Southbound at I-494/MN 5, where the southern terminus lies. 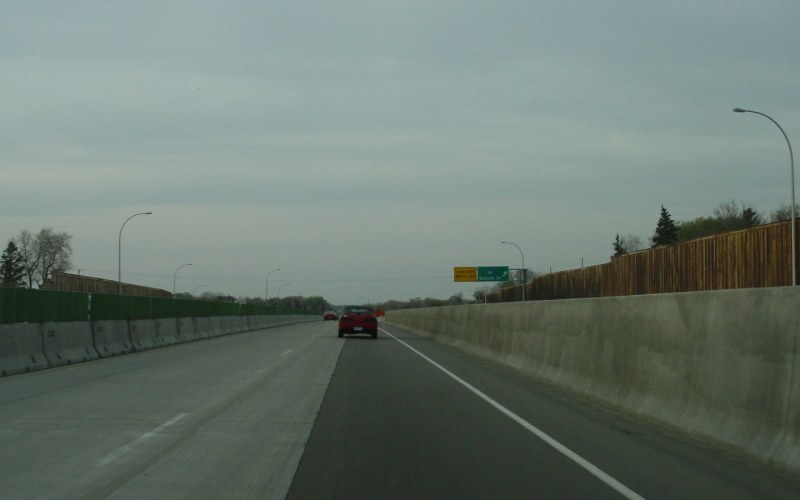 The roadway continues past I-494 as Normandale Blvd/Hennepin CSAH 34. Photo by Glenn Olson, taken March 17, 2002. 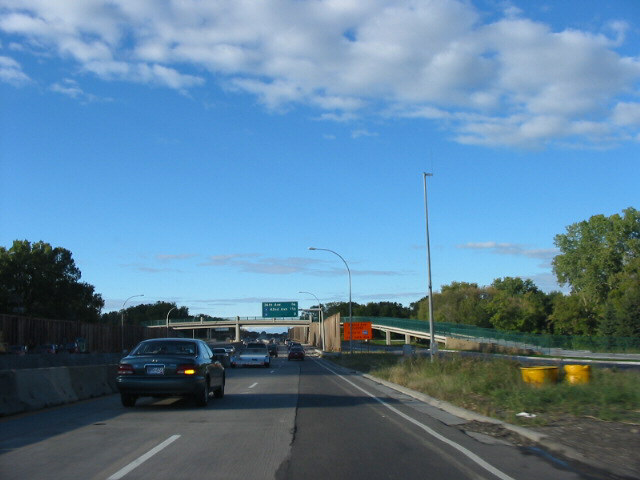 Southbound at the I-494/MN 5 overpass. 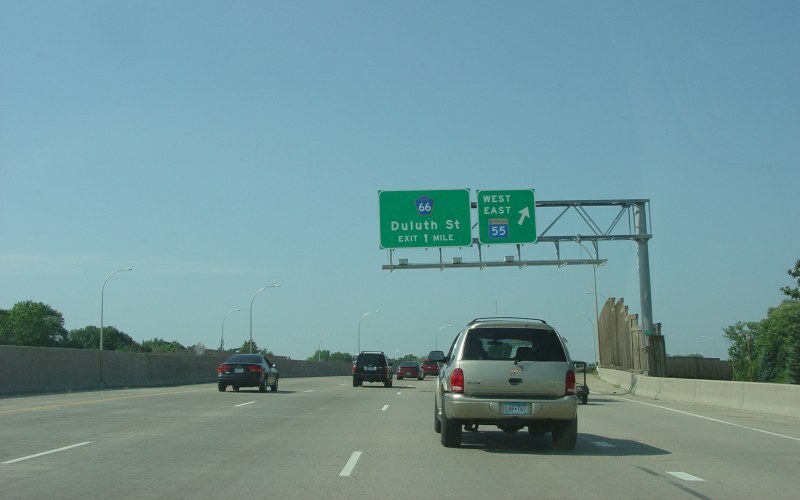 Just beyond the loop to EB I-494/MN 5 is an END MN 100 shield. 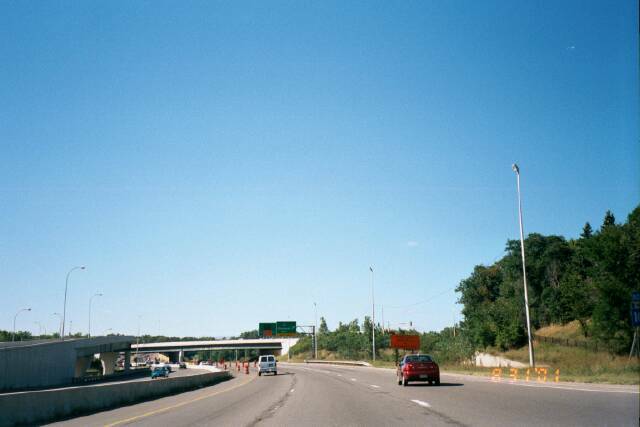 Photo by Adam Froehlig, taken July 29, 2002. 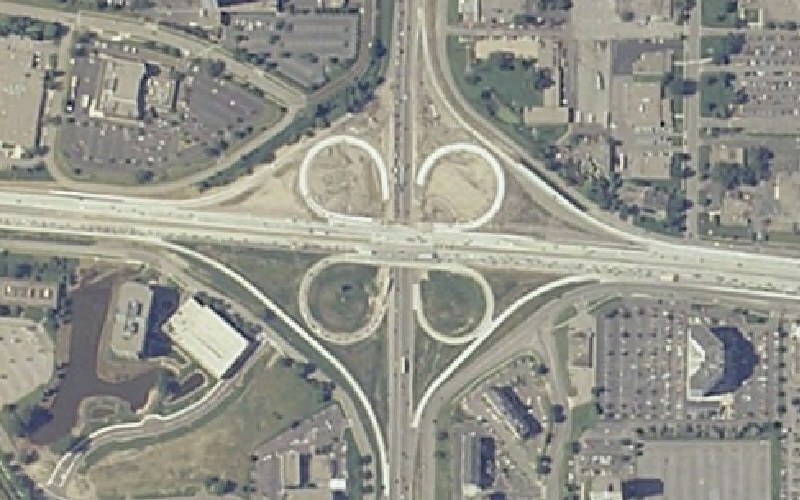 The I-494/MN 100 interchange as seen from above. Aerial view is from 2005 National Agricultural Imagery Program imagery. 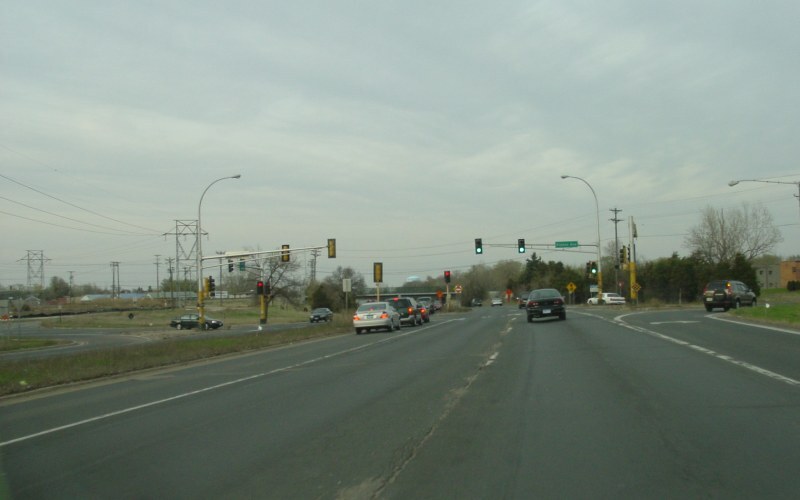 At the northern terminus, MN 100 splits, with the exit going to Humboldt Ave N and the mainline merging in with eastbound I-694. Photo by Glenn Olson, taken March 17, 2002. 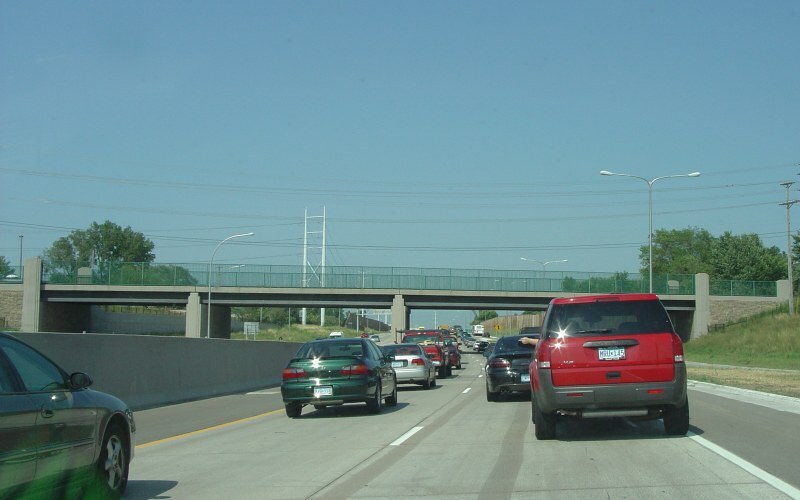 This high-glare view is where the ramp from SB MN 252 splits to MN 100 and WB I-94/694. 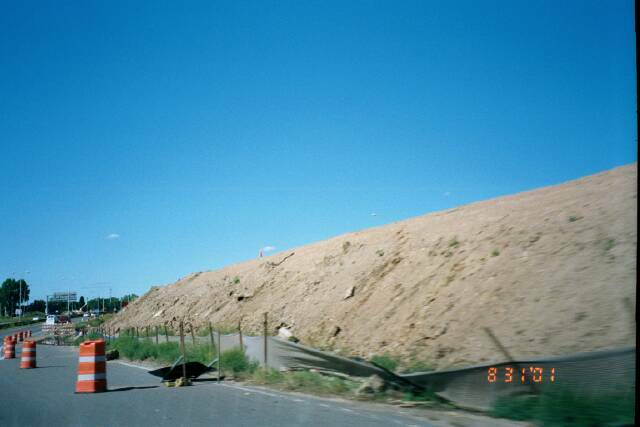 Photo by Adam Froehlig, taken July 29, 2002. 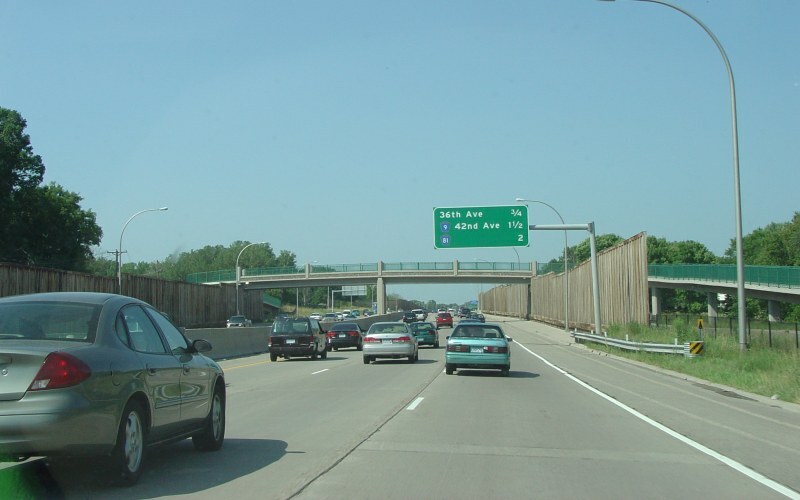 This vantage point of where MN 100 splits off from I-694 is along westbound I-94. 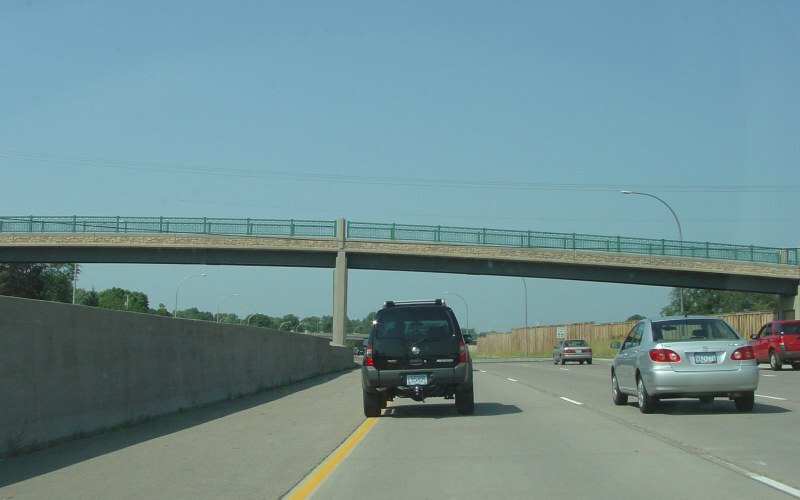 There is no access between I-94 and MN 100 here. Photo by Adam Froehlig, taken June 22, 2004. 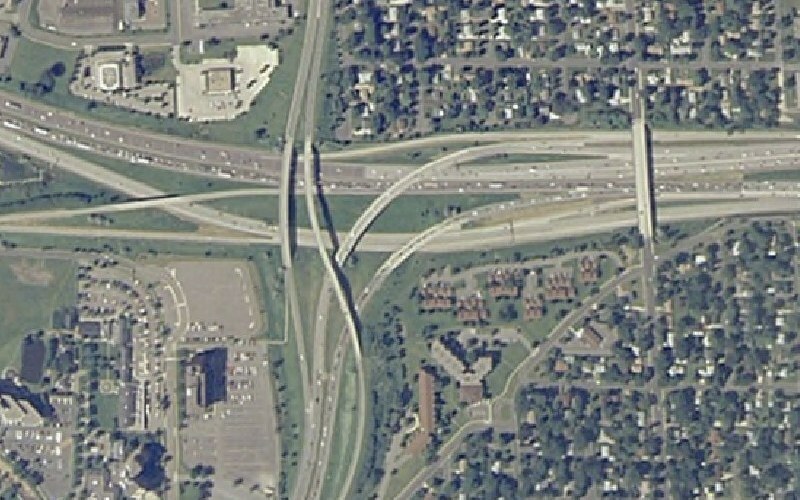 Overhead image showing MN 100 and its connections to Humboldt Ave and I-694 EAST. Aerial view is from 2005 National Agricultural Imagery Program imagery. 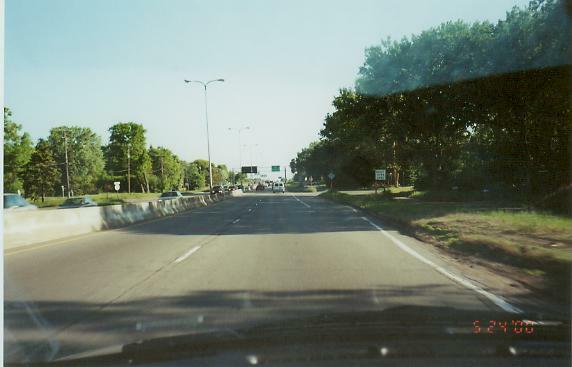 Approaching Glenwood Ave and the beginning of construction on northbound MN 100. Photo by Glenn Olson, taken August 31, 2001. You can see that, at this stage in the construction, all traffic has been switched to the southbound lanes at the Glenwood Ave overpass. 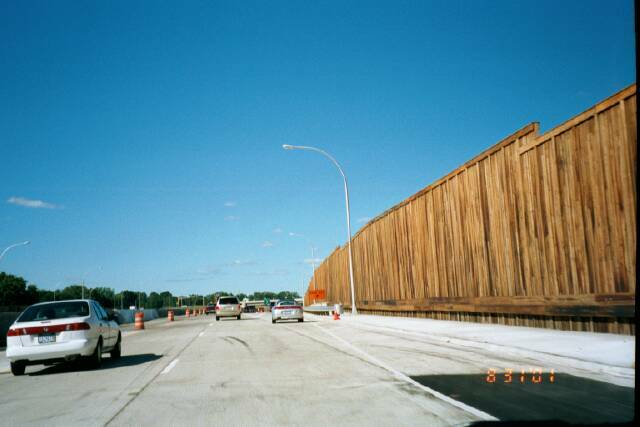 Photo by Glenn Olson, taken August 31, 2001. Another view at the Glenwood Ave overpass. Photo by Glenn Olson, taken August 31, 2001. 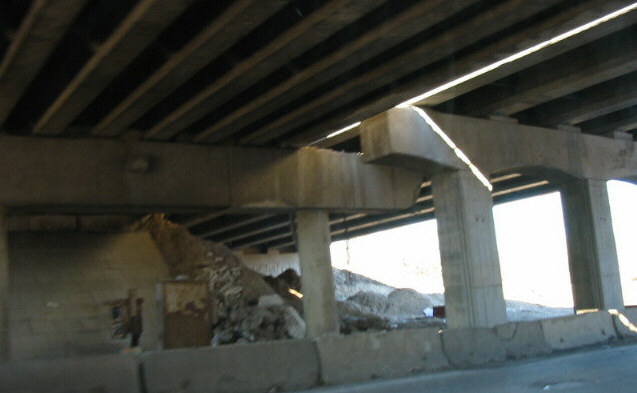 Underneath the Glenwood Ave overpass. 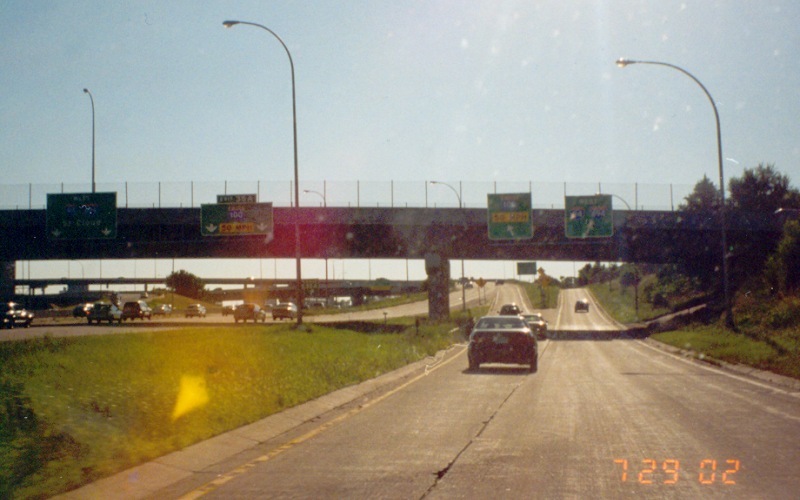 In the first photo, note that all traffic is on the southbound side and there's construction leading into the MN 55 interchange. In the second photo, much of the construction just north of Glenwood Ave is complete. 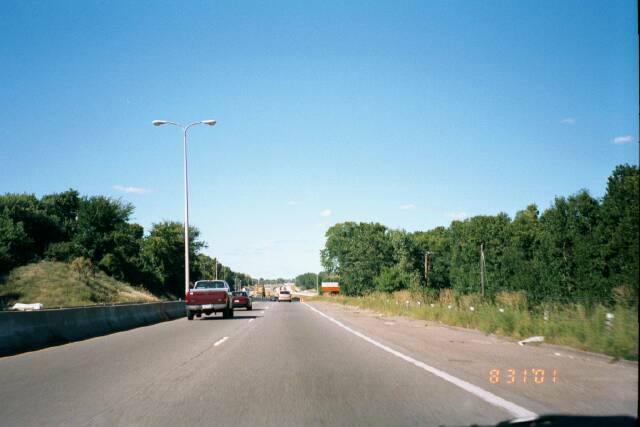 First photo by Glenn Olson, taken August 31, 2001. 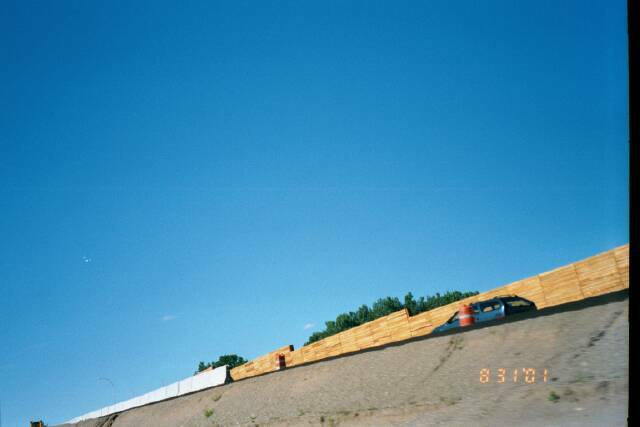 Second photo by Adam Froehlig, taken April 24, 2003. 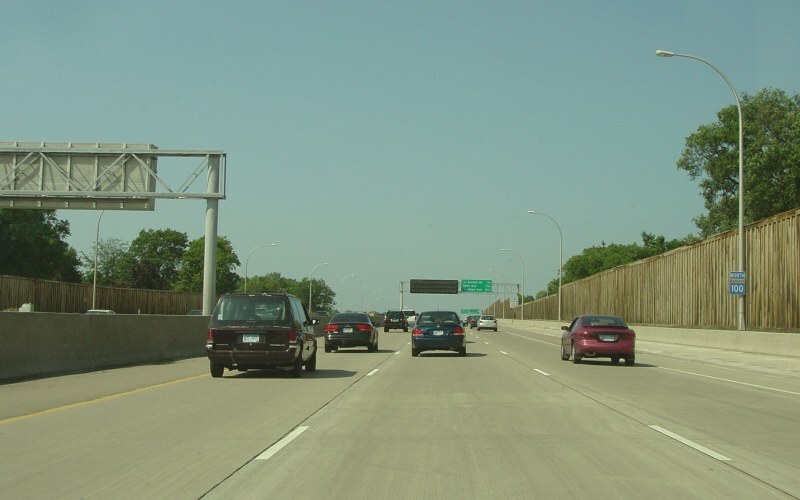 At this time, northbound MN 100 traffic wishing to exit to MN 55 was using the then-existing northbound lanes, while all through traffic in both directions was using the southbound lanes. Photo by Glenn Olson, taken August 31, 2001. Northbound mainline work, on the curve just before the MN 55 interchange. Photo by Glenn Olson, taken August 31, 2001. 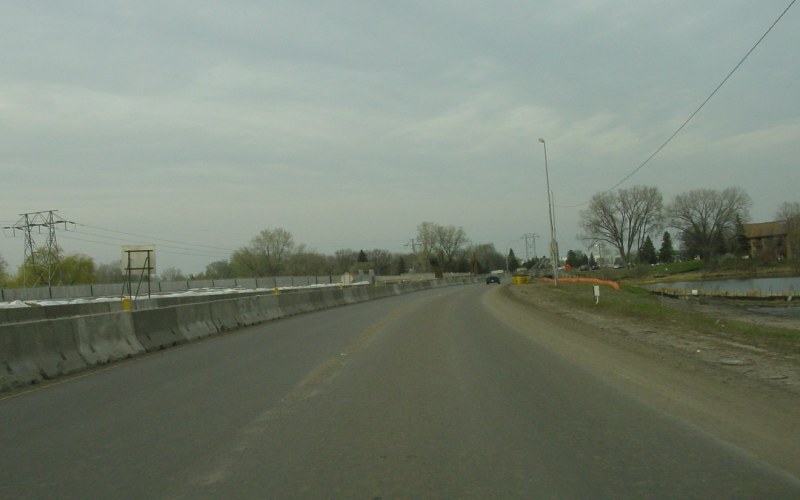 Photo showing the northbound approach to and the construction of the northbound bridge over MN 55. Photo by Glenn Olson, taken August 31, 2001. 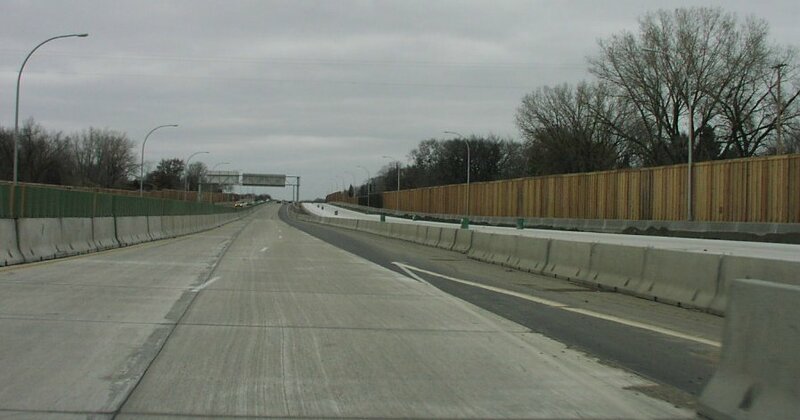 Back on the newly opened northbound lanes approaching the MN 55 interchange. 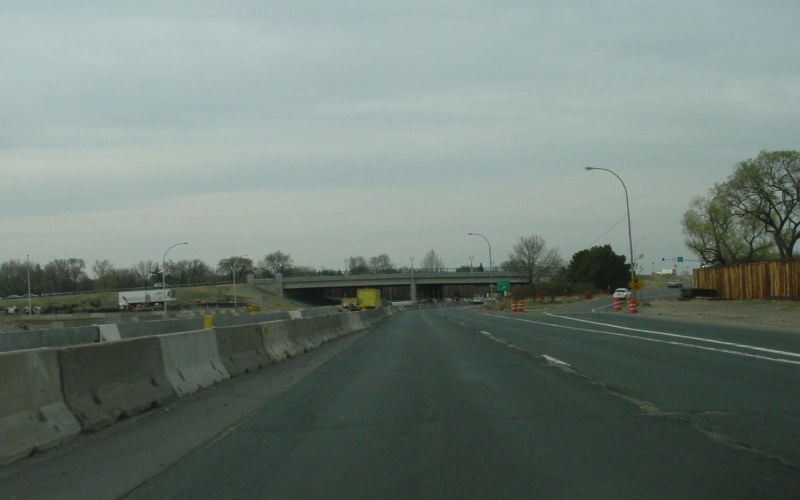 This section was largely completed by November, 2002. Photo by Adam Froehlig, taken April 24, 2003. Same location as the above photo, showing the fully completed project. Photo by Adam Froehlig, taken August 8, 2005. 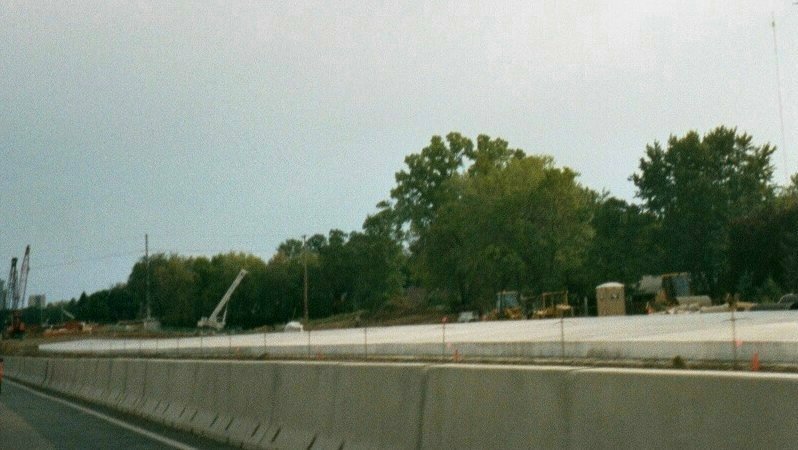 This pre-construction photo shows the old EB 55 to NB 100 loop merging, and guide signage for the old NB 100 to WB 55 loop. Photo by Glenn Olson, taken May 24, 2000. 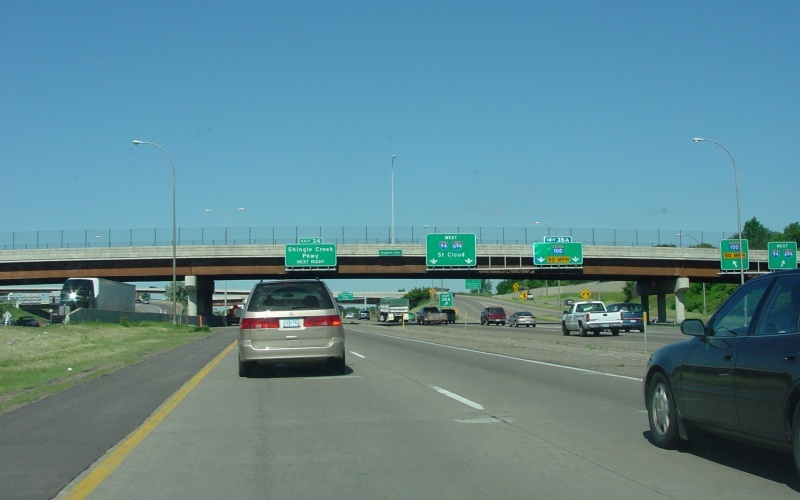 Above MN 55, northbound traffic is directed onto the southbound lanes. Photo by Adam Froehlig, taken April 24, 2003. 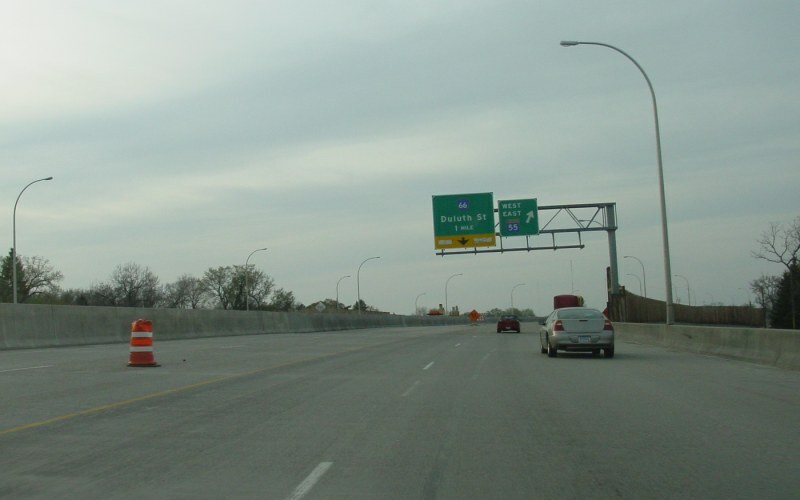 More northbound lane work, on the north side of the MN 55 interchange. Photo by Glenn Olson, taken August 31, 2001. 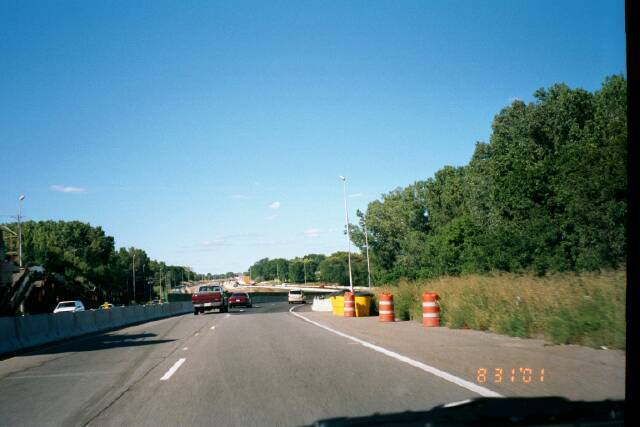 A newer northbound picture from just north of MN 55. The crane in the background sits atop the future northbound bridge over a Union Pacific RR spur. Photo by Glenn Olson, taken November 24, 2002. 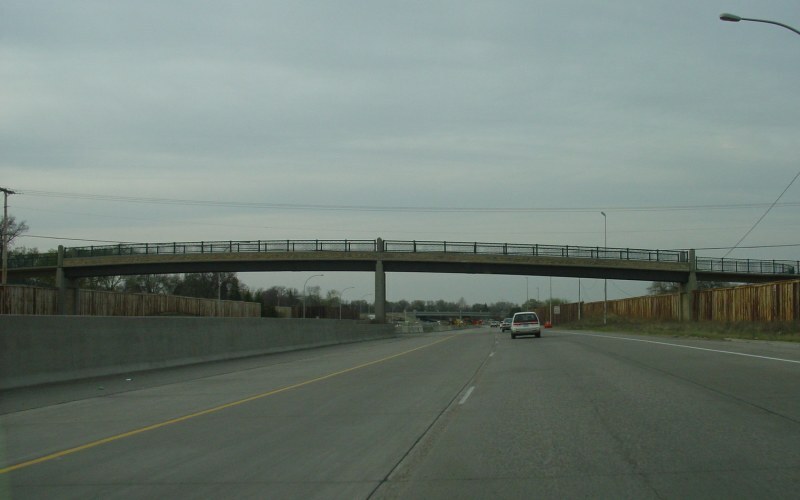 A view of the above-mentioned northbound bridge over the Union Pacific spur. Photo by Adam Froehlig, taken April 24, 2003. 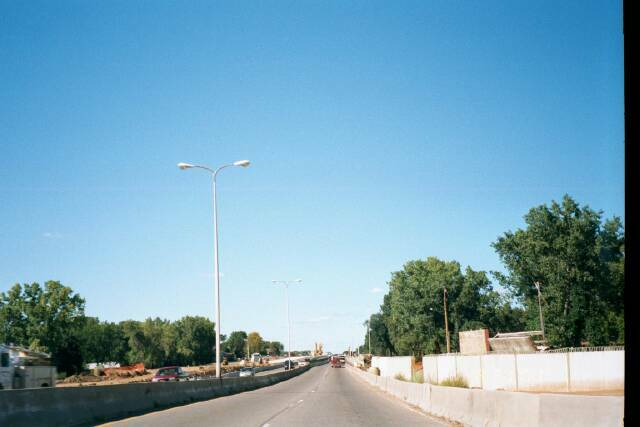 This pre-construction photo shows the northbound lanes at Thotland Rd, just north of the Union Pacific RR bridge. Photo by Glenn Olson, taken May 24, 2000. New pavement for the southbound lanes. The location is believed to be just north of the Union Pacific RR spur. Photo by Glenn Olson, taken August 31, 2001. Exactly 2.5 years later, north of the Union Pacific RR bridge. 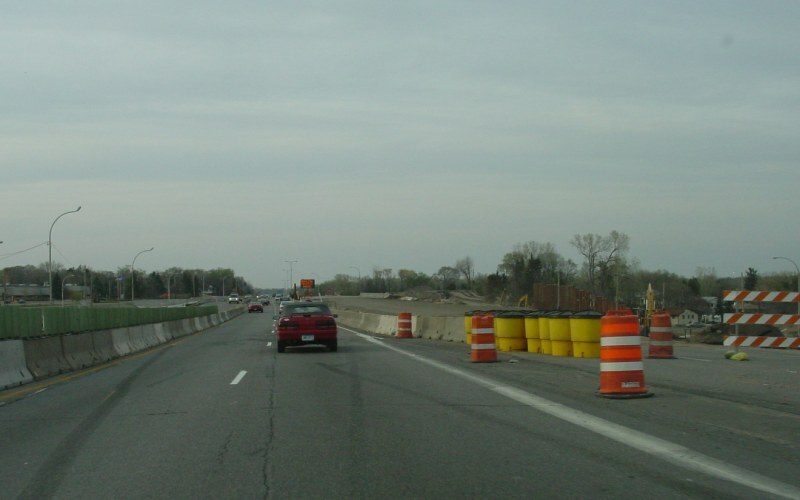 The southbound lanes are largely complete and in-use while construction continues on the future northbound lanes. Photo by Glenn Olson, taken November 24, 2002. In this northbound photo, taken between the Union Pacific RR spur and Golden Valley Rd, you can see clearing work in preparation for the main roadway work. Photo by Glenn Olson, taken August 31, 2001. 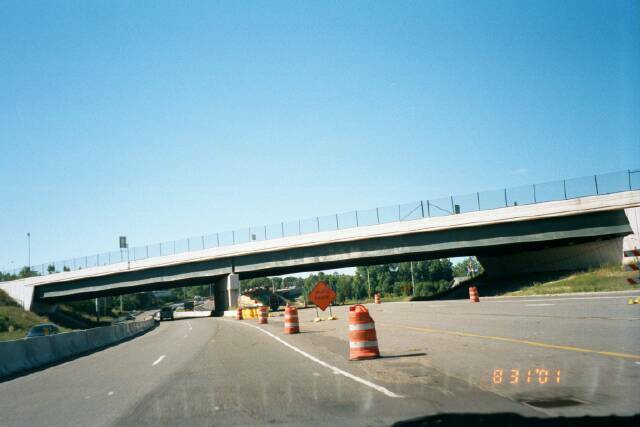 This pre-construction photo looks northbound, approaching the exit to Duluth St/CSAH 66. 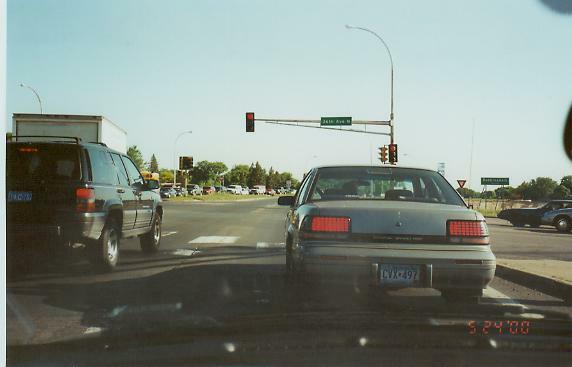 Photo by Glenn Olson, taken May 24, 2000. Just south of Duluth St/CSAH 66, and all traffic is in the northbound lanes. Photo by Glenn Olson, taken August 31, 2001. 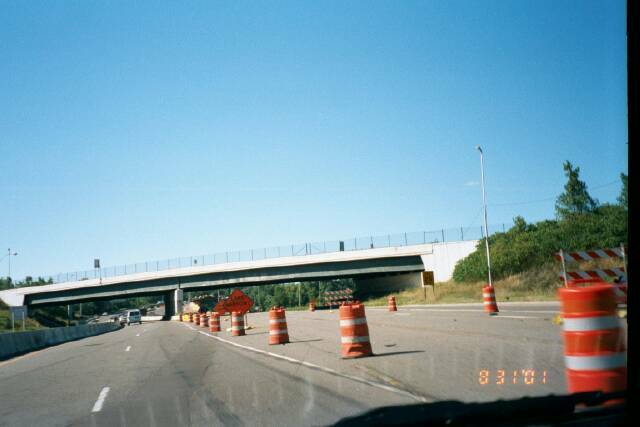 This photo, also just south of Duluth St/CSAH 66, shows construction mostly completed. Photo by Glenn Olson, taken summer of 2003. 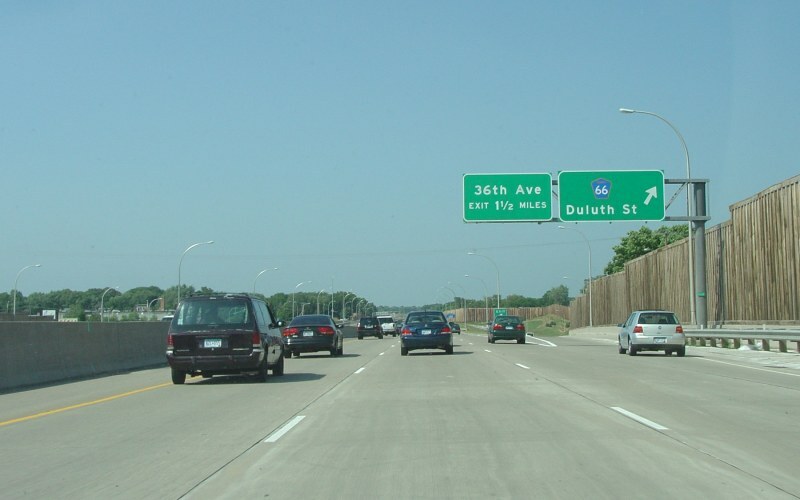 Just short of the above photo, this is how the approach to Duluth St looks today. Photo by Adam Froehlig, taken August 8, 2005. Just north of the above photo. 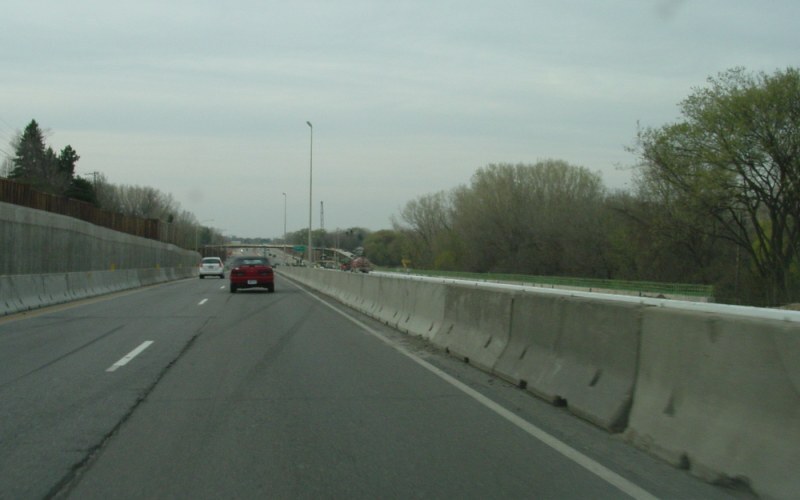 The northbound lanes were mostly complete here but traffic was still on the southbound side of the highway. Photo by Adam Froehlig, taken April 24, 2003. 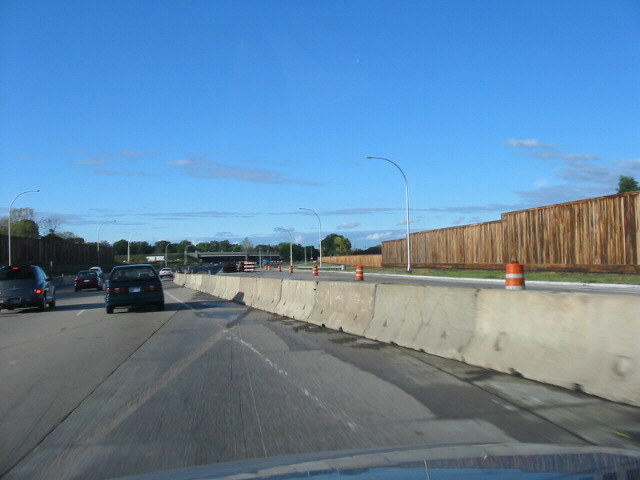 Northbound at the temporary exit to Duluth St/CSAH 66. Construction for the bridge over Duluth St is noticeable in the background. Photo by Glenn Olson, taken November 24, 2002. 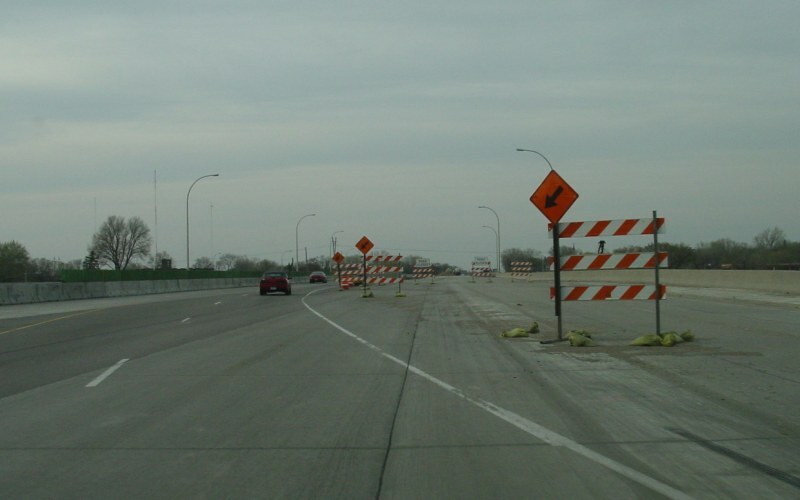 The northbound bridge over Duluth St/CSAH 66 is completed, and work is underway on the bridge approaches. 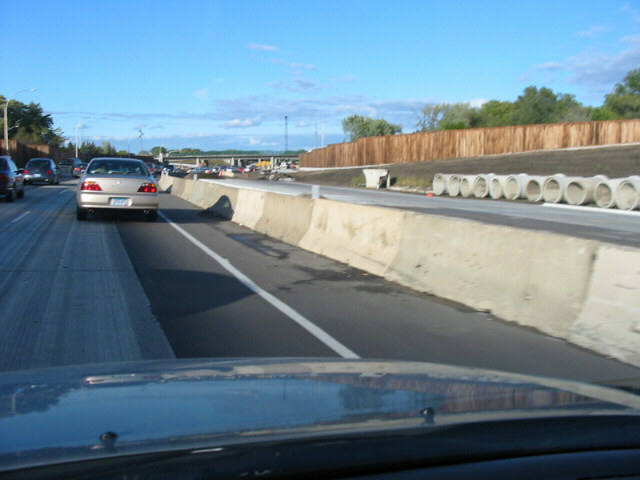 This work would be completed later in the year and traffic shifted over, as shown in the next photo below. Photo by Adam Froehlig, taken April 24, 2003. 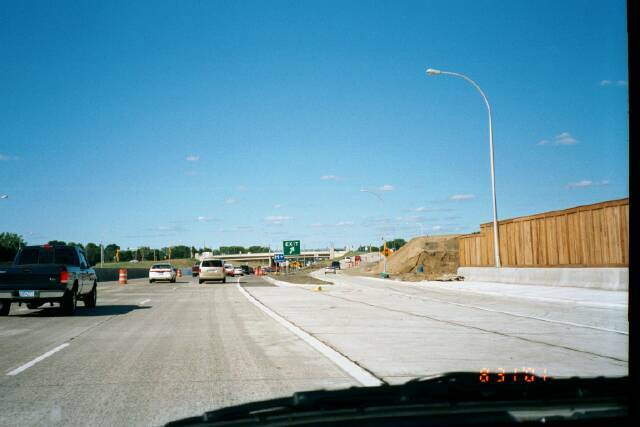 This photo shows completion of the northbound exit to Duluth St/CSAH 66. 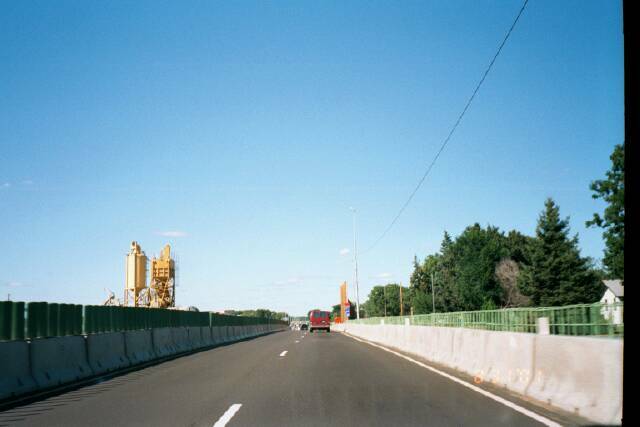 All traffic was on the new northbound bridge while the southbound bridge was under construction. Photo by Glenn Olson, taken summer of 2003. 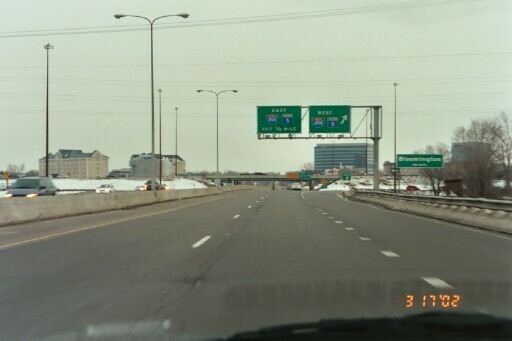 The northbound exit to Duluth St today. Photo by Adam Froehlig, taken August 8, 2005. Closer-up picture of the bridge construction on the northbound side. Photo by Glenn Olson, taken November 24, 2002. Underneath the bridge. 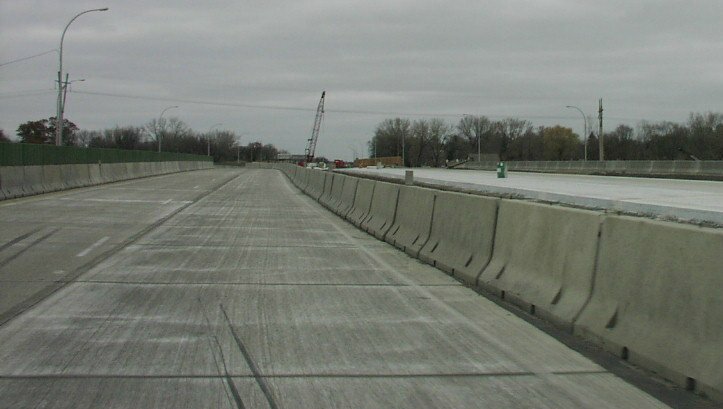 The bridge on the right is the brand new bridge for the future northbound lanes on MN 100. The older bridge on the left is the old bridge, at the time being used for northbound traffic. Photo by Glenn Olson, taken January 11, 2002. 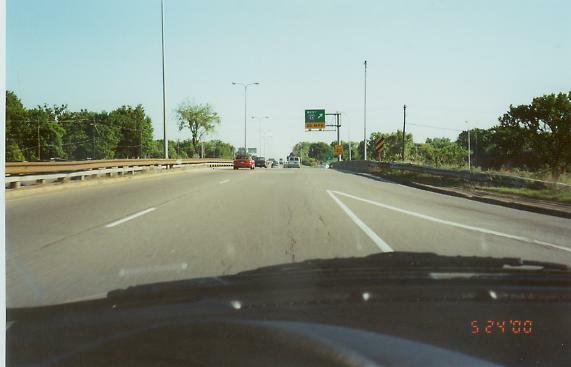 North of Duluth St. At this time, construction had not begun on this immediate stretch. 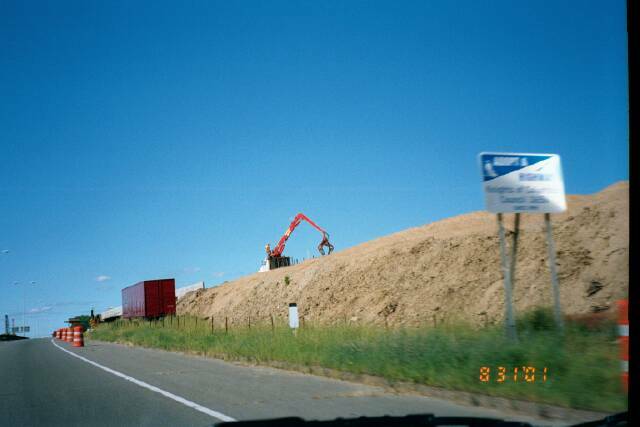 However, in the background you can see construction work associated with the 36th Ave N interchange construction. Photo by Glenn Olson, taken August 31, 2001. 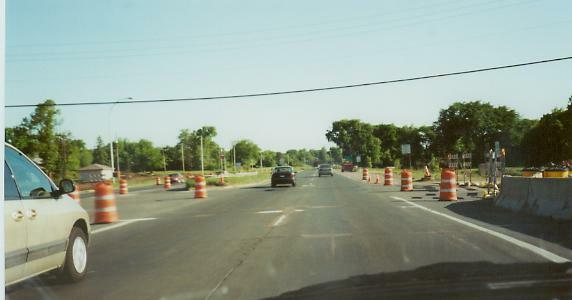 This pre-construction photo looks at the northbound lanes in the vicinity of 29th Ave N. Photo by Glenn Olson, taken May 20, 2000. 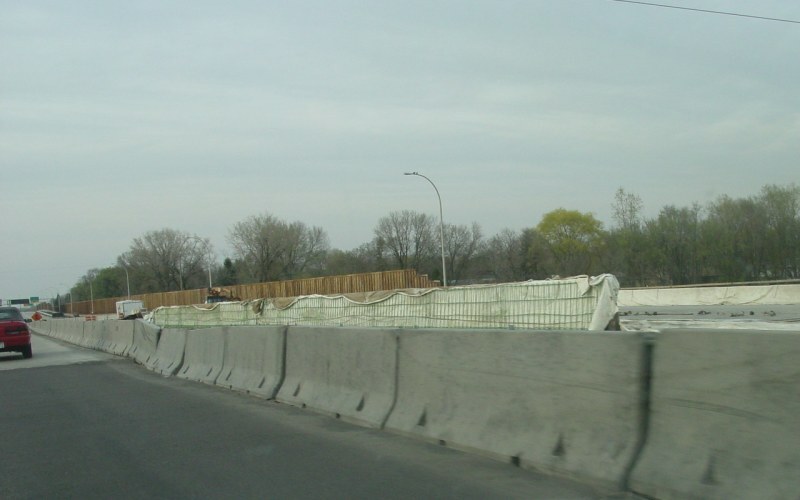 Further north, near Bassett's Creek and 29th Ave N, showing the temporary bypass used during construction of the Bassett's Creek culvert. Photo by Glenn Olson, taken August 31, 2001. Approaching a crossover over to the newly completed section north of 29th Ave N. Construction of the northbound lanes approaching the crossover point is underway. Photo by Glenn Olson, taken November 24, 2002. Same location as the above photo. The northbound lanes approaching the crossover are mostly complete, as is the pedestrian bridge mentioned in the next photo below. Photo by Adam Froehlig, taken April 24, 2003. At the crossover. The pier in the middle is for the Bassett's Creek pedestrian bridge. Photo by Glenn Olson, taken November 24, 2002. 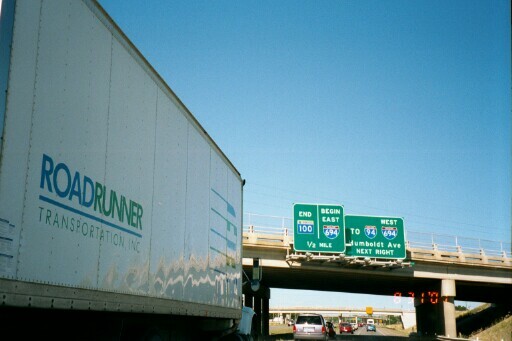 Here's a view of a new overhead distance sign, as seen from the end of Unity Ave. Photo by Glenn Olson, taken January 11, 2003. 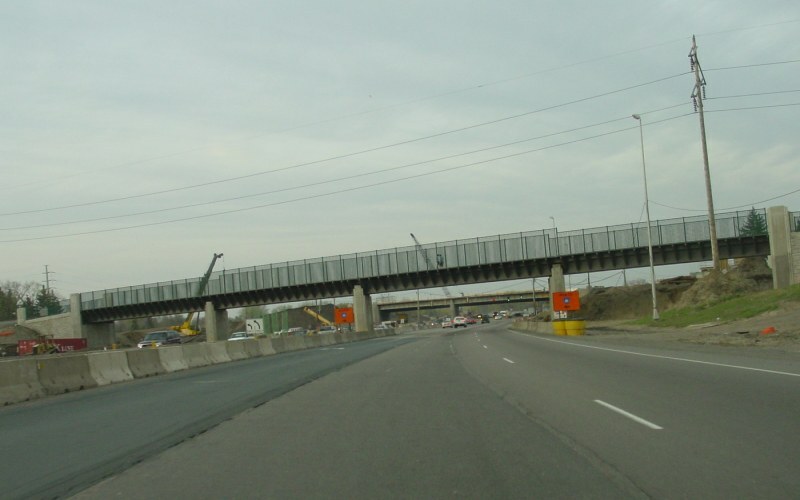 A later view, showing the completed pedestrian bridge. Photo by Glenn Olson, taken summer of 2003. The final "project complete" view. Photo by Adam Froehlig, taken August 8, 2005. Approaching 36th Ave N on a completed section. 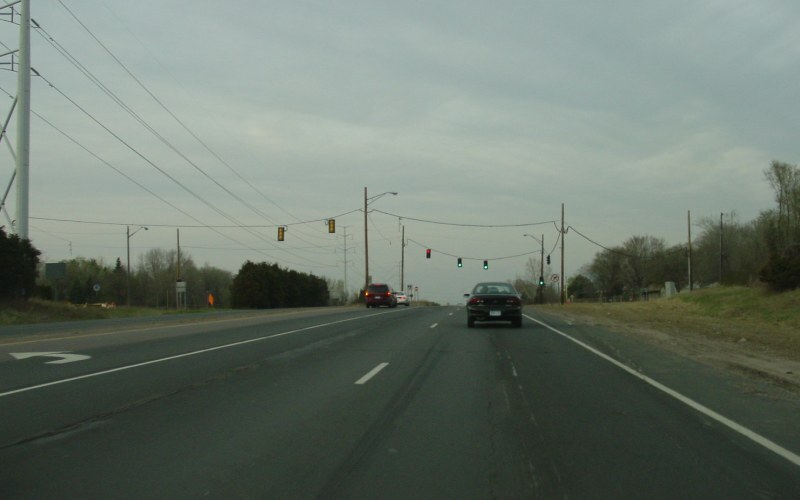 Note how the rightmost lane was striped as an auxiliary lane at the time. Photo by Adam Froehlig, taken April 24, 2003. Northbound approaching the then-36th Ave N intersection, just after construction on the new interchange began. Photo by Glenn Olson, taken May 24, 2000. Northbound at the old intersection itself. Photo by Glenn Olson, taken May 24, 2000. 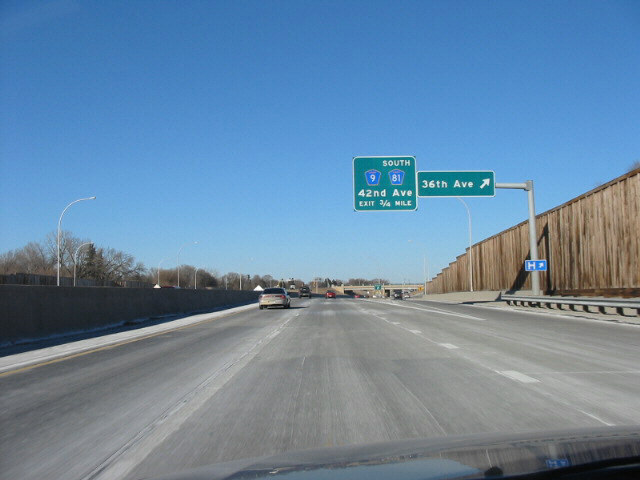 Northbound at the then-recently-opened 36th Ave N interchange. Photo by Glenn Olson, taken August 31, 2001. 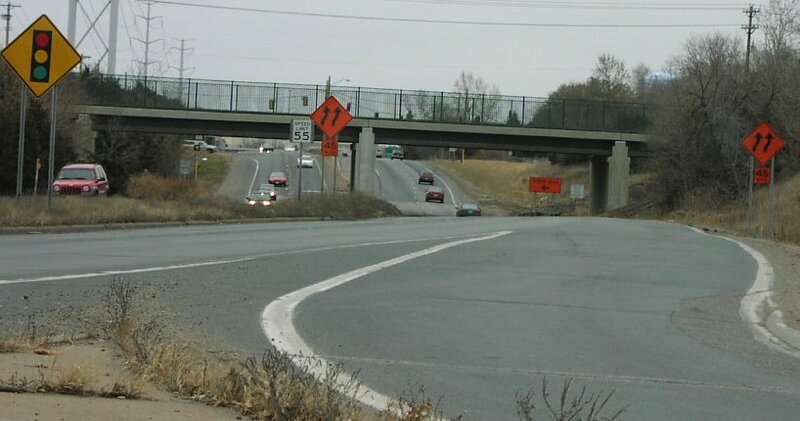 Another view, showing the northbound off-ramp itself, as well as the overpass in the background. Photo by Glenn Olson, taken August 31, 2001. 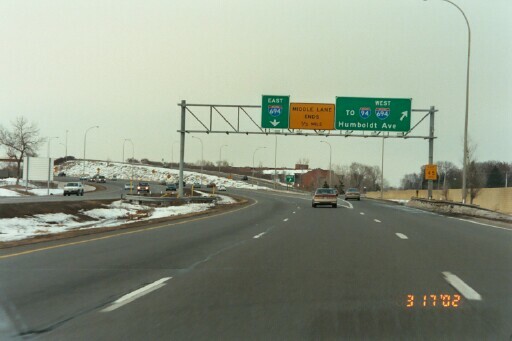 A later view of the northbound off-ramp showing the overhead guide sign, but with the next exit guide sign partially covered. Photo by Glenn Olson, taken November 24, 2002. 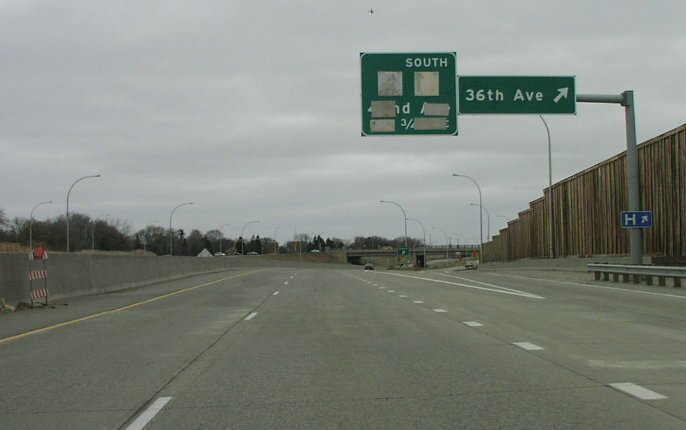 A later view, showing the CSAH 9/CSAH 81/42nd Ave sign. Photo by Glenn Olson, taken January 11, 2003. The final "project complete" view, with all 3 lanes open. Photo by Adam Froehlig, taken August 8, 2005. At the 36th Ave N overpass. 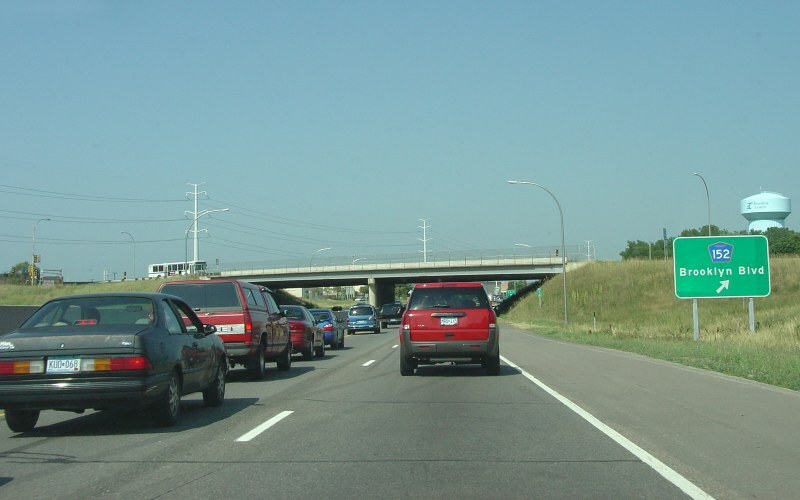 Note how the right lane is striped as an extra-wide shoulder. Photo by Adam Froehlig, taken April 24, 2003. In the northbound lanes. The intersection had just been permanently closed. Photo by Glenn Olson, taken May 24, 2000. A pedestrian overpass replaced the old intersection at 39th Ave N. The 42nd Ave N overpass is in the background. Photo by Adam Froehlig, taken April 24, 2003. 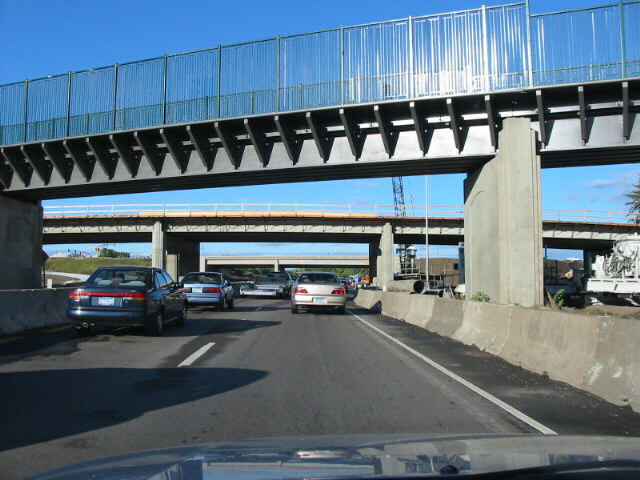 Another view of the overpass with all 3 lanes open. Photo by Adam Froehlig, taken August 8, 2005. 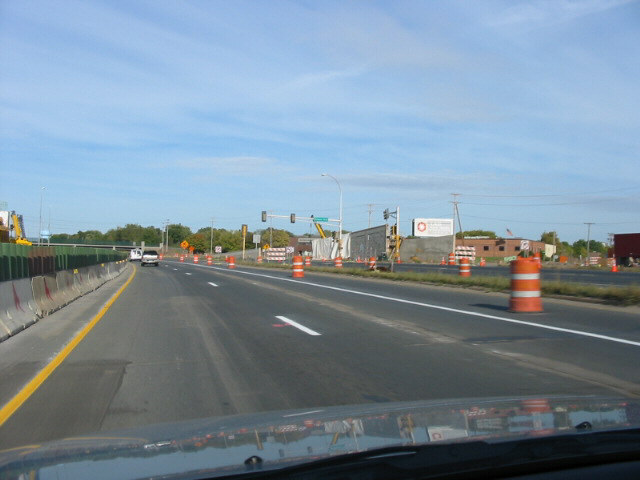 This northbound view from just south of 42nd Ave N/CSAH 9 shows traffic crossing over to the completed southbound lanes in order to facilitate construction of the northbound lanes. On the right, traffic cones direct traffic to the opened NB off-ramp to 42nd. Photo by Glenn Olson, taken summer of 2003. Looking across the mainline at the southbound ramps at 42nd Ave N/CSAH 9. Photo by Glenn Olson, taken November 24, 2002. 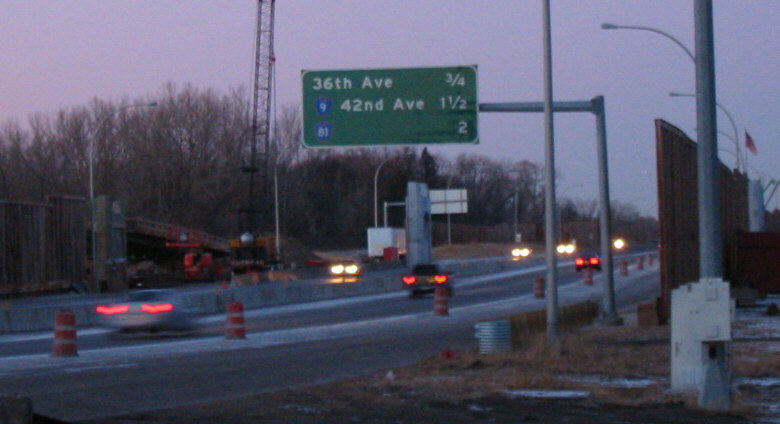 Northbound at the pre-construction exit to 42nd Ave N/CSAH 9. Photo by Glenn Olson, taken May 24, 2000. 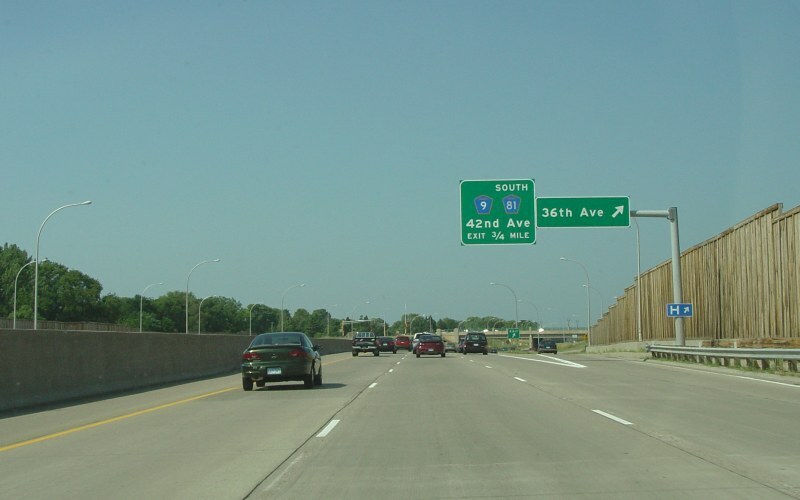 At the northbound exit to 42nd Ave N/CSAH 9. Note now all traffic is on the northbound side, plus much of the original pavement was still in place at the time. Photo by Adam Froehlig, taken April 24, 2003. Northbound at 42nd Ave N with the reconstruction project complete. Photo by Adam Froehlig, taken August 8, 2005. Northbound at the 42nd Ave N overpass. Photo by Adam Froehlig, taken August 8, 2005. A pre-construction photo, looking north from the 42nd Ave N overpass. Photo by Glenn Olson, taken October 15, 2000. 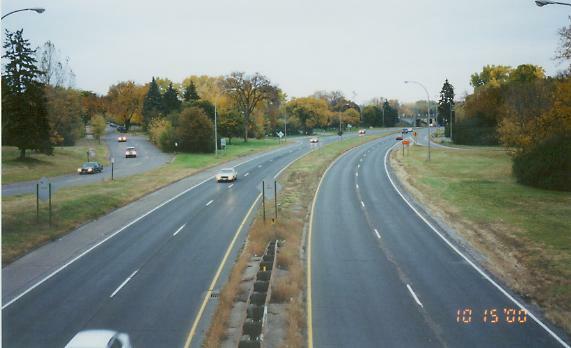 Looking northbound just north of the 42nd Ave N/CSAH 9 overpass, with all traffic in the future southbound lanes. 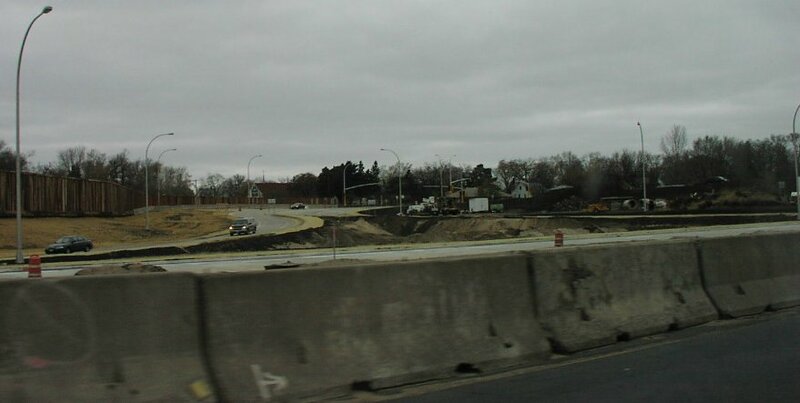 Construction is underway on the northbound lanes and NB ramp from 42nd. Photo by Glenn Olson, taken summer of 2003. 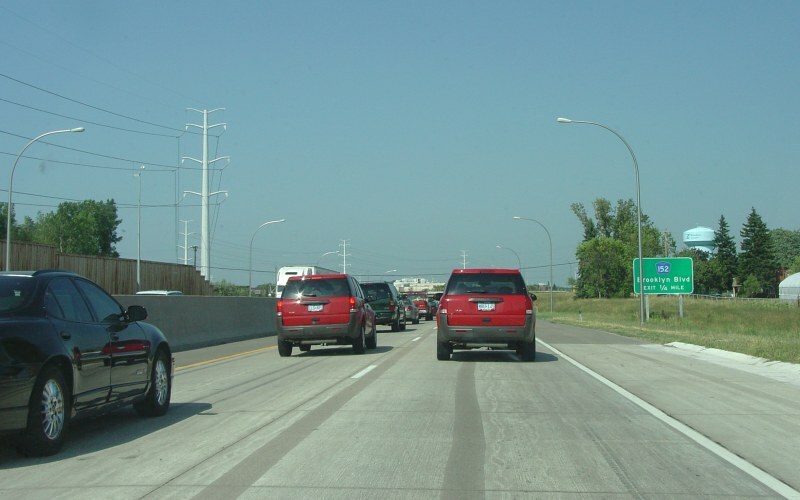 Northbound approaching CSAH 81. The BNSF RR spur bridge is in the foreground. 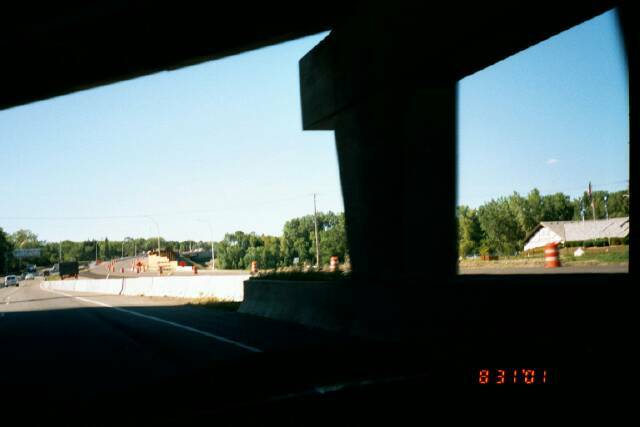 Work is visible on the West Broadway/CSAH 8 overpass, the CSAH 81 overpass (in the far background), and ramp work in the area. Photo by Adam Froehlig, taken April 24, 2003. 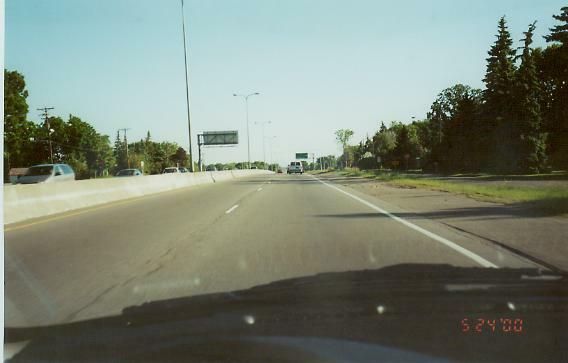 Northbound along MN 100. 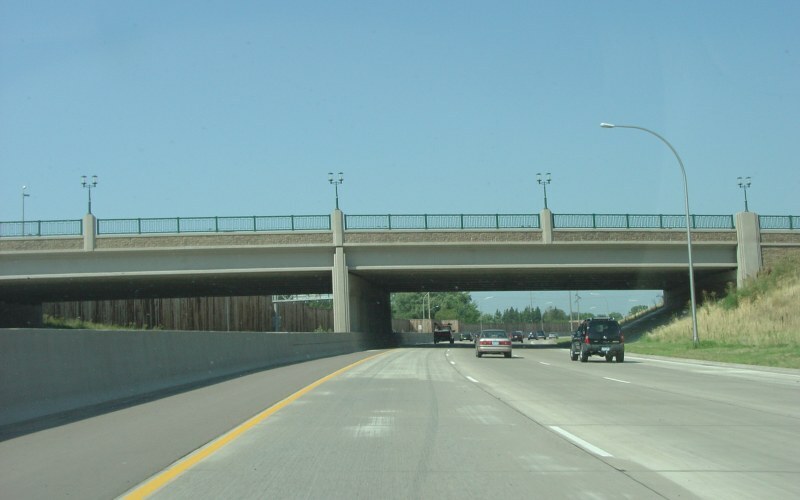 The three bridges, in order, are the BNSF RR spur, West Broadway/CSAH 8, and CSAH 81. Photo by Glenn Olson, taken summer of 2003. 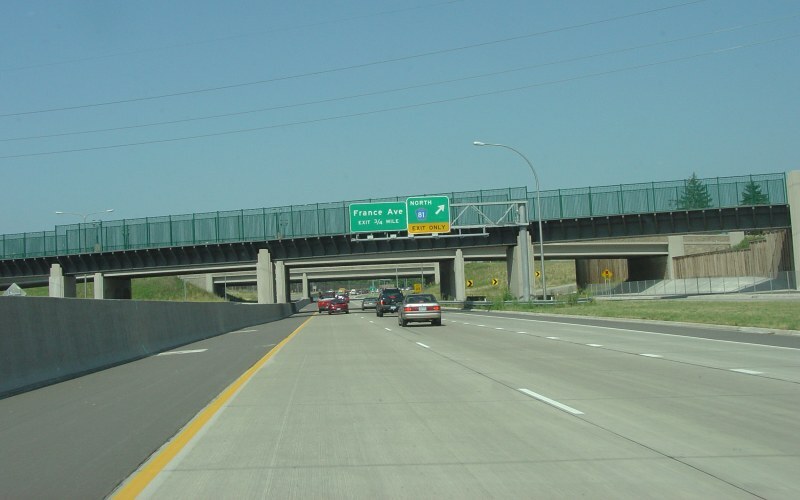 Similar location to the above two photos, showing guide signage at a completed CSAH 81 interchange. 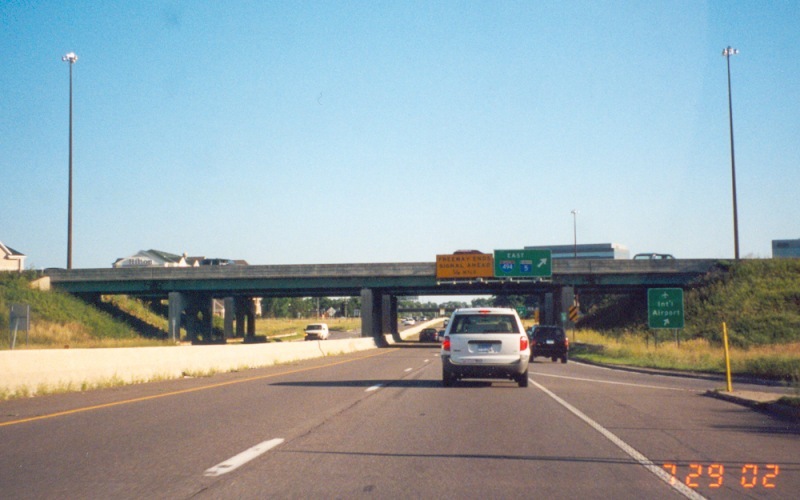 The ramp on the far right connects 42nd Ave N to CSAH 81. Photo by Adam Froehlig, taken August 8, 2005. 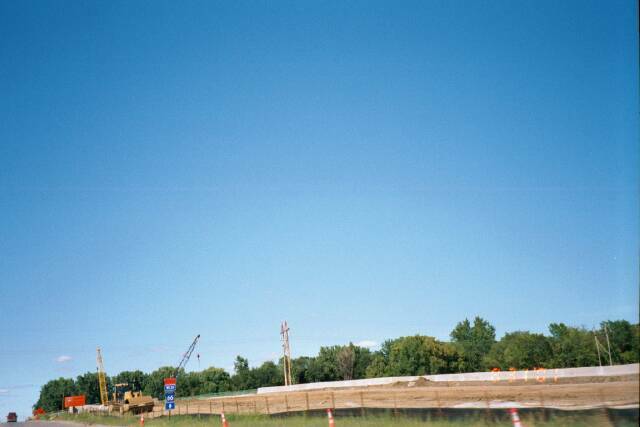 At the temporary intersection with CSAH 81, while work progresses on the new CSAH 81 overpass behind it. Photo by Adam Froehlig, taken April 24, 2003. 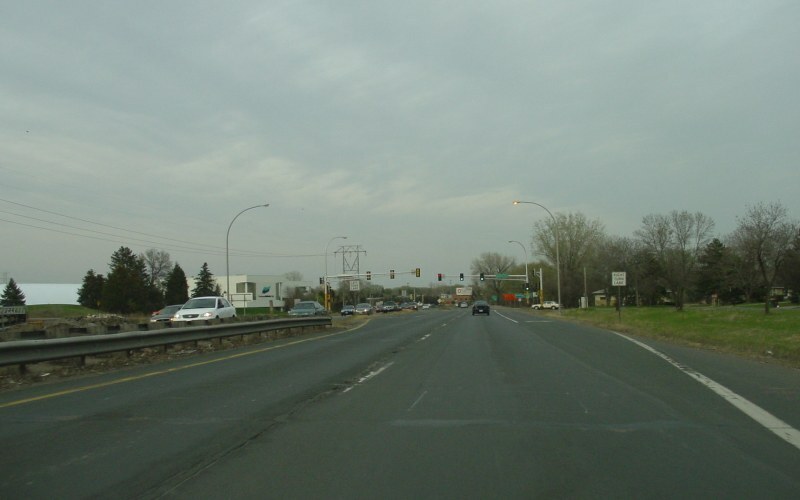 Northbound, approaching the Twin Lakes crossing. 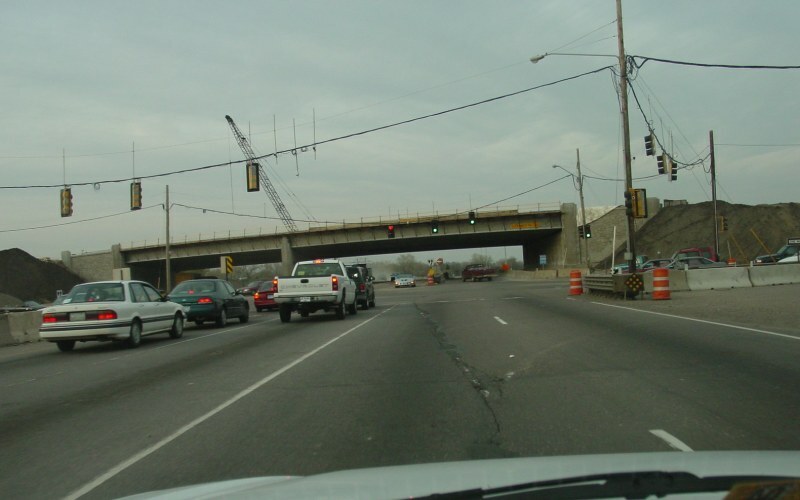 All traffic was on the northbound side while the southbound bridge and appraoch was built. Photo by Adam Froehlig, taken April 24, 2003. Northbound approaching the then-Indiana Ave N intersection. Dirt piling for the project is evident, but curiously is gone by 2003. Photo by Glenn Olson, taken August 31, 2001. About the same location as the above photo. Note how the dirt pile is gone and construction still had not yet begun in this area. Photo by Adam Froehlig, taken April 24, 2003. Northbound at France Ave. 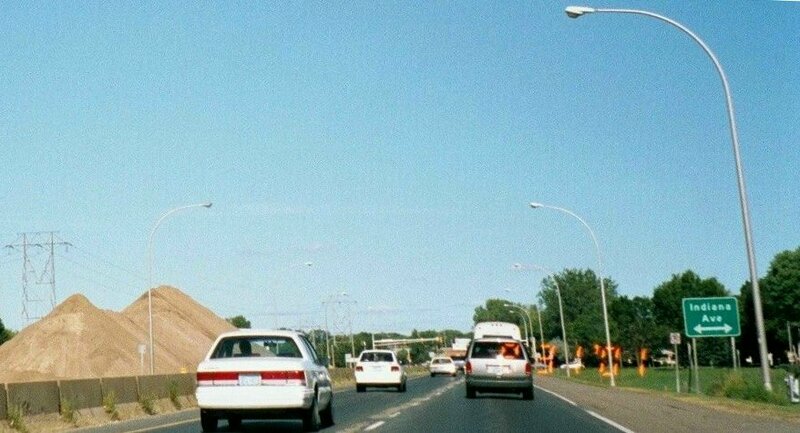 Although auxiliary/parallel road construction had been completed (as noted in the above photos), construction on the mainline or the new France Ave interchange had not yet begun. Photo by Adam Froehlig, taken April 24, 2003. Northbound at the completed France Ave interchange. Photo by Adam Froehlig, taken August 8, 2005. This photo shows all traffic using the southbound lanes in the vicinity of the old France Ave intersection. 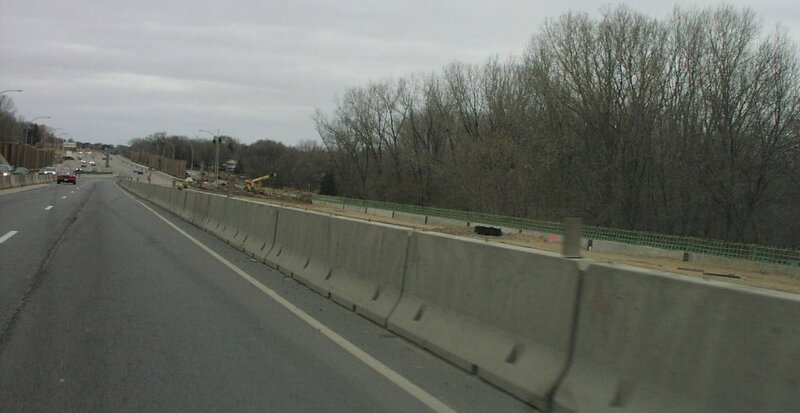 The construction behind the old traffic signal is retaining walls for the future northbound on-ramp, also shown below. Photo by Glenn Olson, taken summer of 2003. Looking northbound at the Canadian Pacific RR overpass. A temporary intersection at 50th Ave N is in the background, behind the RR overpass. Photo by Glenn Olson, taken August 31, 2001. 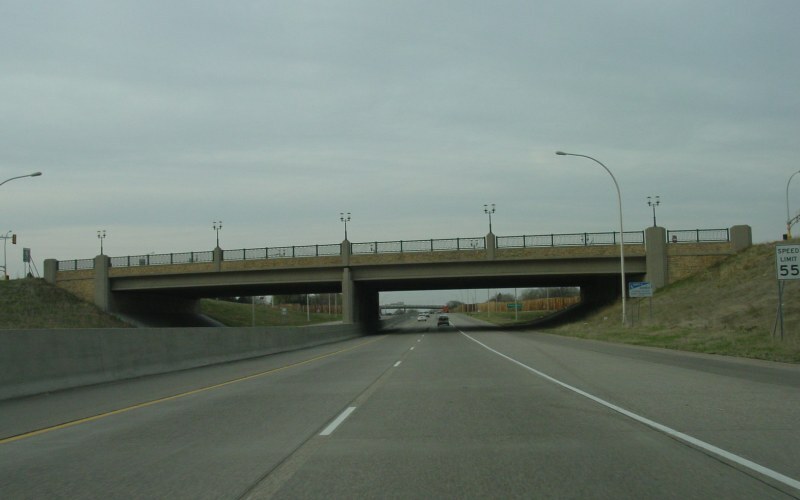 The Canadian Pacific overpass as viewed after project completion. Photo by Adam Froehlig, taken August 8, 2005. Northbound at the temporary 50th Ave N intersection. Photo by Adam Froehlig, taken April 24, 2003. 1/4 mile advance guide sign for the upcoming Brooklyn Blvd/CSAH 152 interchange. This location also marked the northern end of the reconstruction project. Photo by Adam Froehlig, taken August 8, 2005. 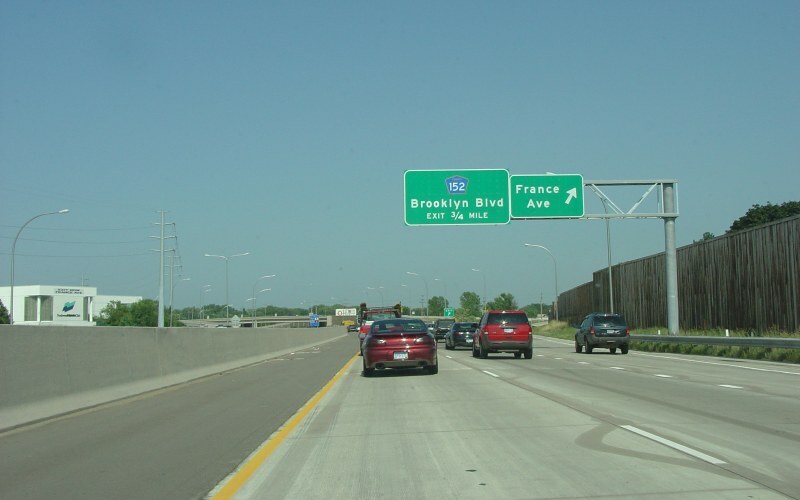 The northbound exit ramp to Brooklyn Blvd/CSAH 152 is a loop ramp. Photo by Adam Froehlig, taken August 8, 2005. 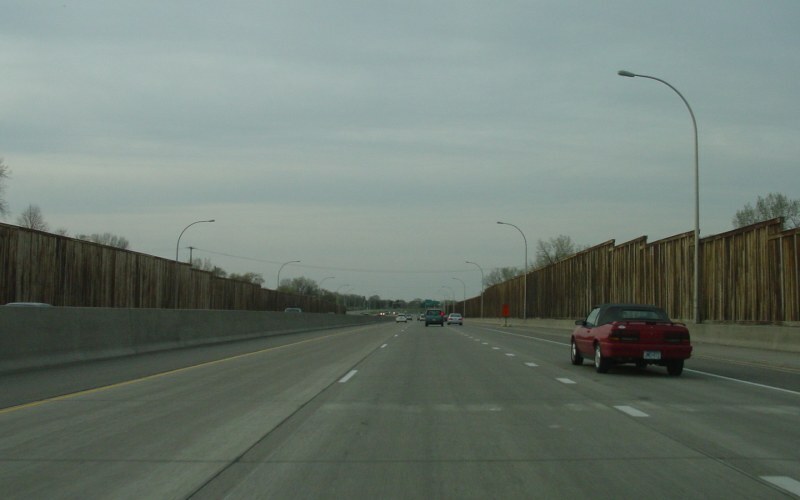 Northbound MN 100, approaching the northern end at I-694. Photo by Glenn Olson, taken August 31, 2001. As noted above, southbound photos are on a separate page.